It's Getting Crazy at Loch Ness - Time to Visit! I will be driving off to Loch Ness soon as I take a few days break. With the recent photographs of dorsal fins and strange looking water disturbances, I feel a bit more stoked than usual as I think through the activities that will be done. That is also set against messages I am getting that some new and potentially better photographs will soon be published. I haven't seen them, so it's really a matter of wait and see. In fact, another photograph hit the news as I was typing this article and it produced a very weird looking "animal". It was taken halfway between Dores and Inverfarigaig last Saturday afternoon by an Ian Bremner who claimed he did not notice it until he reviewed his images later. The original story can be found here. Now when I zoomed in on the head, my first thought was "seal". But, of course, the rest of a seal does not normally look like what followed. A classic head and two humps or three seals swimming in a line? 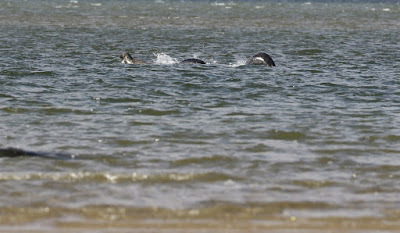 The mind began to boggle ... first the dorsal fin of a dolphin and now three seals chasing each other. Loch Ness is getting crazy these days. I went down to the shore next to the new floating jetty at 8.43pm. Then immediately saw the outline of a small, say 17 inch wide domed dark head which seemed to be aware of my presence and just sank within less than one second. This was at the very extreme dregs of daylight. Too dark to confirm additional sightings ... 65% percent certain, it was a seal. Looks like your powers of observation could be correct, Gordon. But three seals? Not likely, but possible. 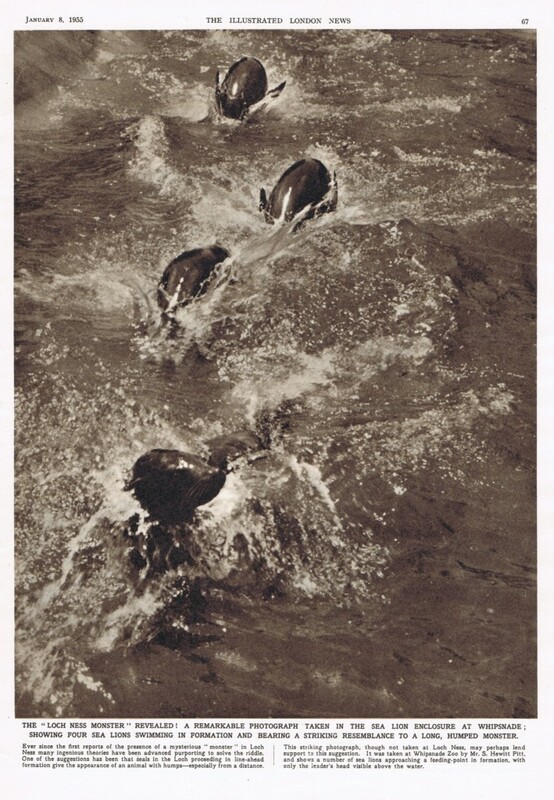 In fact, when I saw the picture, it reminded me of this photo I clipped a while back from Whipsnade Zoo in 1955. And how could we forget that amusing manatee cartoon! But, if these are three seals, it is still a remarkable picture. However, like the dorsal fin, I would expect some confirmatory pictures. 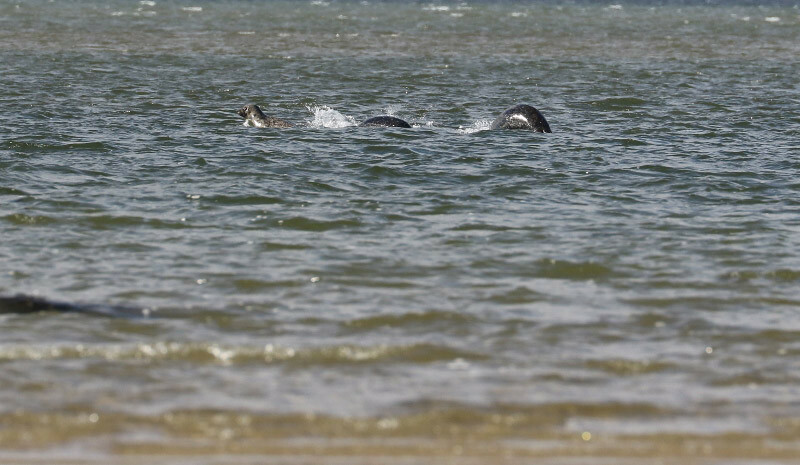 After all, three seals in Loch Ness, should not be so easily hidden. Perhaps I will spot them myself as I head up to the loch this weekend. Meanwhile, the weather forecast for Loch Ness doesn't look too bad and so I hope to do my usual routines plus some new stuff. I also intend to be at the "Monster Masterclass" run by Jacobite Cruises on the 18th September which will include Nessie stalwarts Steve Feltham, Gary Campbell and Willie Cameron. You can find out more details at this link. Meantime, I leave you with this video I put together recently. It is one of my dawn runs by car up "Monster Alley". This is the stretch of road between Inverfarigaig and Dores where the monster has been most reported coming onto land. What better way to relax than drive up this road as darkness is beginning to recede with the possibility of running into a nocturnal Nessie fleeing from the light like some aquatic vampire?! Okay, that's a bit tongue in cheek as land reports of the monster are even rarer than water sightings and the odds of one being near the creature in such a scenario is very small. But still, I do this run every trip with my dashcam camera attach to the car window ... just in case. The stillness of the night and the complete absence of anyone else does focus the mind a bit more. I am also not quite certain what my strategy should be if a 30 foot long creature does emerge from the forest to the loch? Run it down and solve the mystery forever or get as much recorded data as possible and let it go? I think the answer is obvious. But who knows? Perhaps I will film a "huddle" of three seals crossing the road! You can play the 25 minute video at this link. I got an email from Phil, who follows this blog and sent me some scans from Lea MacNally's 1968 book, "Highland Year". 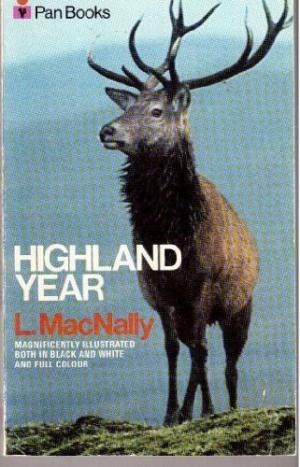 Lea MacNally was an expert in Highland wildlife, with the emphasis on deer as he was a deer stalker. However, it turns out he was also a believer in the Loch Ness Monster and has a sighting to tell off in his book which I reproduce below. I don't think this report made it into the "records". Loch Ness has the distinction, perhaps not altogether enviable, of being known throughout Britain as the home of `the monster'. To me, the fact that its banks afford shelter to a rich variety of wild life is much more of an attraction than any monster. The existence of 'something' in Loch Ness was held as a matter of course by the old folk of the district, and one veteran ex-stalker told me that it was never referred to as 'the monster' then but simply as 'the big beast'! The fact that it was seen on occasion was accepted without fuss or publicity until the newspapers got hold of it and it became a cause for country-wide speculation. I myself, though I was born near Loch Ness and have spent most of my life overlooking it, have never seen the monster. But my wife, not a native of the district, has — and this only a year after she came to live here, a sighting which she has never publicized, and indeed has told to no one but myself. She saw it on a clear sunny June afternoon as she walked down the road from our house with Loch Ness, still as a millpond, before her. An object, as she later described to me, like the dark-coloured head and neck of a giraffe broke the calm, still surface of the loch and proceeded at speed across it, leaving a V-shaped ripple behind it. As suddenly as it had appeared so did it submerge, and within moments the loch was like a mirror again. I envy my wife this sighting, and though I have never seen the monster myself I am convinced that there is something strange in Loch Ness. Many reputable people of my acquaintance have seen 'something'; too many for me to presume to deny its existence. Admittedly, there is not much to go on as it is not a detailed report. However, it was MacNally's own thoughts on the phenomenon that were equally as interesting. He tells us that the "big beast", as it was known, was an accepted part of the loch before 1933. Note no publicity pursued it in those earlier days which is consistent with the small number of reports we have in 19th century media. Finally, too many people had seen "something" to deny its existence. MacNally would have been a frequent observer of the loch. His knowledge of those waters as well as his knowledge of deer and other wildlife clearly did not lead him to think there were "normal" explanations for what was going on at Loch Ness. Mr. MacNally, Fellow of the Edinburgh Zoological Society and the National Trust for Scotland’s first ranger ecologist, I can only agree with you!